GOP reaction-Iran deal: Scott Walker, Lindsey Graham, denounced historic deal with Iran. 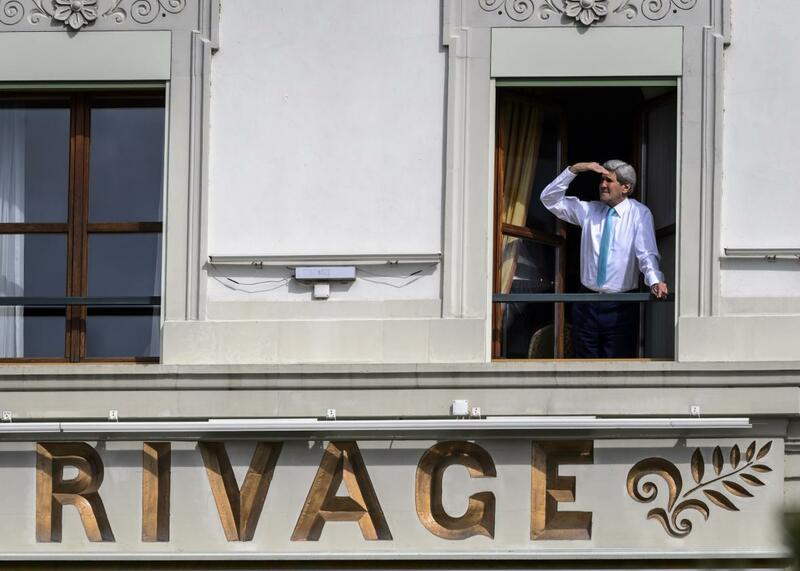 Secretary of State John Kerry looks out the window of his room at the Beau-Rivage Palace hotel during a break in Iran nuclear talks in Lausanne, Switzerland, on April 1, 2015. Still, the work doesn’t end with Tuesday’s announcement and accompanying fanfare. Under legislation passed earlier this year, Congress will have 60 days to review the agreement, a period during which lawmakers could hold a vote of disapproval and take further action to scuttle the deal before it goes into effect. Obama has promised to veto any legislation that undermines the effort—and appears to have enough Democratic support to avoid a veto-override—but the president would obviously prefer to avoid a protracted political fight that could jeopardize a deal that his administration spent nearly two years negotiating. Even assuming the deal survives the 60-day review period, though, it might not survive the next administration. Since the deal is a political agreement—and not a legally binding treaty—the next president could, as Politico’s Nahal Toosi explains, simply use his or her executive authority to reinstate the suspended U.S. sanctions on Iran and/or withdraw from the international panels tasked with implementing the accord. That means that those Republican stump speeches bashing the deal—and more generally the president’s willingness to negotiate in the first place—could be more than just empty bluster. It’ll also be worth keeping a close eye on Hillary Clinton’s reaction given the former secretary of state is generally seen as more hawkish than her former boss, and since the two memorably clashed during the 2008 campaign on the issue of negotiating with Iran. We’ll be rounding up the candidates’ responses below as they come in this morning, although there’s not much doubt about where most of the GOP candidates stand: They hate it. If the initial reports regarding the details of this deal hold true, there’s no way as president of the United States I would honor this deal. It’s incredibly dangerous for our national security, and it’s akin to declaring war on Sunni Arabs and Israel by the P5+1 because it ensures their primary antagonist Iran will become a nuclear power and allows them to rearm conventionally. President Obama’s nuclear agreement with Iran will be remembered as one of America’s worst diplomatic failures. … Instead of making the world safer, this deal will likely lead to a nuclear arms race in the world’s most dangerous region. What’s worse, the deal rewards the world’s leading state sponsor of terrorism with a massive financial windfall, which Iran will use to further threaten our interests and key allies, especially Israel. I have said from the beginning of this process that I would not support a deal with Iran that allows the mullahs to retain the ability to develop nuclear weapons, threaten Israel, and continue their regional expansionism and support for terrorism. Based on what we know thus far, I believe that this deal undermines our national security. The nuclear agreement announced by the Obama Administration today is a dangerous, deeply flawed, and short sighted deal. … The deal does not require Iran to come completely clean up front about possible military dimensions of its nuclear program or include true anytime/anywhere inspections necessary for a nuclear program shrouded in deception and lies. … The clerical leaders in Tehran routinely preach “death to America” and “death to Israel” – and through their acts of terror, they mean it. We must take these threats seriously and should not base any agreements on the hope their behavior will moderate over time. … This isn’t diplomacy – it is appeasement. Shame on the Obama admin for agreeing to a deal that empowers an evil Iranian regime to carry out its threat to “wipe Israel off the map.” … As president, I will stand with Israel and keep all options on the table, including military force, to topple the terrorist Iranian regime. The #IranDeal brokered by @POTUS and #BarackObama Admin almost certain to prove an historic mistake with potentially deadly consequences. [Obama] should have walked away. … The president is playing a dangerous game with our national security, and the deal as structured will lead to a nuclear Iran and, then, a nuclearized Middle East. The deal threatens Israel, it threatens the United States, and it turns 70 years of nuclear policy on its head. I would have ratcheted up those sanctions. I would have continued to put pressure on this regime to capitulate. What we have here is not a capitulation. … The Iranians have never kept a deal. Never. If you want a good deal, you’ve got to walk away sometimes. We never did. … I think unfortunately as we know Iran has already cheated on sanctions and inspections regimes so there’s no real guarantee right now that the’re going to play fair. Congress should oppose this dangerous deal. Secretary Clinton should be a voice of reason and oppose this deal. While Secretary Clinton has been the architect of President Obama’s foreign policy, she can do the right thing and prevent Iran from obtaining a nuclear weapon and oppose this deal. I don’t understand the president. He dealt from desperation, and he shouldn’t have been desperate. … You know the Iranians are going to cheat. They’re great negotiators and you know they’re going to cheat. The #IranDeal is a victory for diplomacy over saber-rattling and could keep us from being drawn into another never-ending war. More on Clinton’s response—and previous doubts about the deal—here.